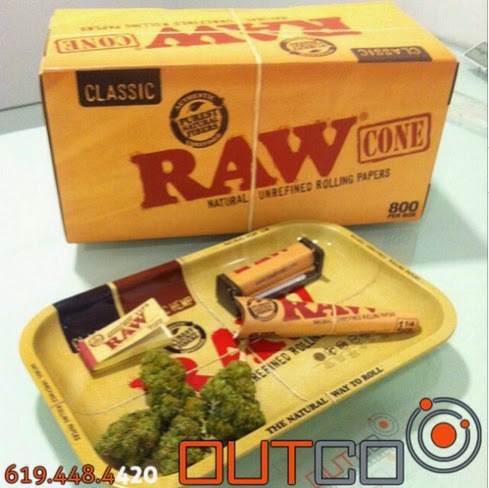 RAW is well known for it's unrefined and unbleached rolling paper that contain no additives. The product is popular with the customers at OUTCO in El Cajon, San Diego due to it's natural non-toxic properties. RAW is produced in Alcoy, Spain where the origins of rolling paper come from the days of Christopher Columbus. Rolling papers for cigarettes originate from the late 1400's. Columbus brought back cigars to Spain from Cuba. As told in the history of RAW on their website, Cuban cigars at that time were only available to aristocrats. Left over stubs were re-rolled with newsprint making the first rolled cigarettes. Alcoy, Spain became the central city for making rolling paper in the 1800's. At first they were a bleached white paper to signify cleanliness and hygiene. The craft of making papers thin and with flavor originated and were refined in Alcoy. In the 1900's Barcelona's bigger factories took over the rolling paper industry. Alcoy remained to have artisans making small batches of rolling paper with antique machines. The founder of RAW, Josh Kesselman had a desire to make an unrefined natural paper. He received a lot of discouragement for the brown paper from manufacturers. The industry told Josh that nobody wanted to smoke a paper bag. Taking a risk he put his money into the RAW project and proved that their was a demand by smokers for a natural product. Today RAW is one of the most popular brands for its non-toxic, additive free paper. I appreciate to your information that makes this blog useful in the searching about Rolling Papers and Cones For Sale and getting easy information in the Purchase Branded Chemicals.